I have a confession to make. I’m forty. I aged out in June and I am forced to face the fact that I’m statistically closer to the grave than the cradle. In many ways I don’t feel forty yet. I feel like I’m still becoming who I was meant to be. I don’t feel like I’m established. There is so much I had hoped to accomplish at this point, there is security which has eluded me, such as a fulfilling job and life success. Authors Peter Greer and Greg Lafferty both have successful ministry careers. Greer is the president and CEO of Hope International, a global micro-finance organization. Lafferty is the senior pastor of Willowdale Chapel in Jennersville, Pennsylvania. Greer watched Lafferty navigate his forties and decided to learn from him about how he could avoid a midlife crisis and be propelled towards meaningful mission (17). 40/40 Vision: Clarifying Your Mission in Midlife is Greer and Lafferty’s call for us to reevaluate our lives and press into the things which matter. Lafferty and Greer share vulnerability about their experience of aging. They also engage a third dialogue partner: Qoheleth. The author of Ecclesiastes provides insights on refocusing our life midstream. Greer and Lafferty (and Qoheleth) address midlife (ch. 1), the meaninglessness of life (ch. 2), disappointment with our life not going how we had planned (ch.3), the lose of ‘thrill'(ch. 4), facing mortality (ch. 5), growing in generosity (ch. 6), breaking the addiction to go-go-go (ch. 7), aging well (ch. 8), deepening our relationships in midlife (ch. 9), relinquishing control (ch. 10), finding meaning outside of ‘a job’ (ch. 11), and living a life with lasting purpose (ch. 12). In their introduction, Greer and Lafferty write, ” Our hope is that this is not just another self-help book loosely based on Christian principles or a list of ways to ease the symptoms of midlife. Rather, we want to address the underlying questions of midlife through the timeless wisdom fo Ecclesiastes. Although many issues in their forties, others face them in their thirties or fifities” (17-18). Sharing vulnerably from their life experience, they delve into each theme, highlighting the wisdom and insights of Ecclesiaties and exploring what it means to live life on mission in life’s latter half. This book speaks meaningfully to me in a way I wish it did not. I would rather be young, invincible, and immortal. But the experience of forty means I have to face up to life and press forward knowing that reckoning and resurrection await those who fear God and keep his commandments (183-184). Greer and Lafferty’s conversational tone draws you and causes you to reflect on what life could be like moving forward. I recommend this book for those near forty, those who are forty or fortyish, and those who saw forty a long time ago and still pretend they are forty. Greer and Lafferty show how Ecclesiastes speaks to midlife. I give this four stars. When I was a kid, I rode my bike everywhere. When the clouds part here in the Pacific Northwest and we have a brief respite from the lingering dark, I ride still. But my kids do not. My oldest is seven and has a bike of her own and no training wheels, but she doesn’t know how to ride. The biggest reason she doesn’t is because she hasn’t logged enough learning hours. I have a job with unpredictable hours and I am often at work when the sun shows herself. My wife is home, but with two other kids in tow teaching her is hard. She usually leaves me the responsibility of teaching the kids anything where they may die (bike riding, swmimming, mountain climbing, sky diving, etc.). Day one: No Fear because my dad has me. Day two: Balance (the secret to balance is to keep pedaling). Day three: Steering–you avoid obstacles by looking ahead and where you look is where you” go. Day four: Braking–learning how to stop and how to slow down. Day five: starting from a standstill (getting back up after a fall). Howerton uses the framework of these lessons with his son to talk about life. On day one, he holds the back of his son’s seat as he rides. He got him. In similar fashion, God has us (except he doesn’t actually let go like Howerton does). On day two, Howerton draws a correlation between the way our weight shifts as we pedal uphill, with the imbalances of our everyday life. He advocates balance in every area but love. We don’t balance love with unlove, but we do balance everything else (i.e. work/life, selfishness/self care, action/patience, etc.). Day three has us paying attention to where we want to end up ( our ultimate destination) and what is in our way. Wtih Howerton’s son, we learn the importance of slowing down on day four and on day five Howerton shares vulnerably about picking himself after facing difficult personal circumstances. Howerton is a pastor and these refelctions are rooted in our life with God. He shares practical insights into the spiritual life. I enjoyed this book and find it helpful. Learning to ride is an apt metaphor for learning the disciplines which will enable us to thrive in life. 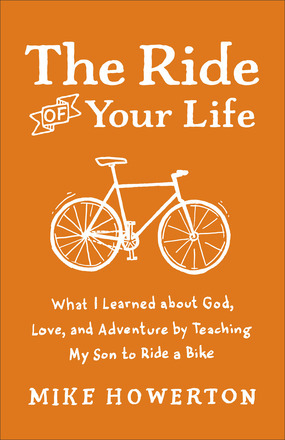 Beyond Howerton’s pastoral goals, I find this book helpful for giving me a framework to teach my daughter how to ride. For that I give this book four stars. Notice of material connection: Thank you to Baker Books for providing me with a copy of this book in exchange for my honest review.